Services for Sidney C. Anders, 44, of 4403 Gunnison St., Wichita, Kan., formerly of Moline, are 11 a.m. Monday at St. PaulAMEChurch, Moline. Burial is in NationalCemetery, ArsenalIsland. Visitation is 2 to 4 and 7 to 9 p.m. Sunday at Esterdahl Mortuary Ltd., Moline. A memorial fund has been established. Mr. Anders died Wednesday at WesleyMedicalCenter, Wichita. He was born July 16, 1944, in Moline, where he married Kay Ann Kettering Sept. 2, 1972. He was a top salesman with the Budget Rental Car Sales, Wichita, where he was currently employed. He was in the Special Services Division of the Army during the Vietnam War. He served seven years in the Army. There, he had a varied athletic career: competing on teams that won the Fifth Army track and handball championships; garnering all-tournament honors on a basketball team that finished third in an All-Army championship; and playing flag football. He was a coach for young people in basketball and football in the Wichita area. 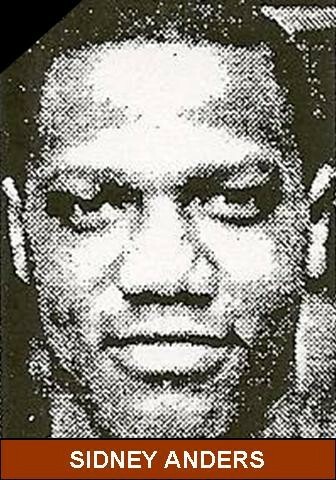 He played basketball on MolineHigh School team in the 1960's, graduating in 1962. He played basketball only at GrandviewJunior College, Des Moines, for two seasons before joining the Army. Survivors include the widow; a daughter, Jaime, at home; sons, John and Jason, both at home; his mother, Irene Tirrell, Detroit, Mich.; a sister, Myrna Earley, Moline; and brothers, Sherman Tirrell, Louis Tirrell and Theodore Tirrell, all of Detroit. He is also survived by a cousin, Paul Carther, Moline, Ill. This makes me very sad. Sid was such a sweet, sweet guy. I remember tutoring him for US history and I really liked him a lot. I remember he was number 77, I think, on the football team. I also remember him playing basketball and running track. He and his brother John were outstanding athletes at MHS. I had no idea he had passed away so young. Sid was one of the best friends and teammates anyone could possibly wish for. A great competitor with a terrific sense of humor. Both he and his older brother John carried on the Anders family tradition with honor during the early 60's. I feel lucky to have shared the court with both of them. Sidney---I miss you roomie.